Woo, Sock #2 is done! and it has diagonal stripes in spots. it couldn't be helped. it annoys me, but i think my roomie will like the pair just the same. i would model the sock for you, but it won't fit over my gargantuan calves. fortunately, my roommate has the skinniest legs EVER, so they should fit her fine. 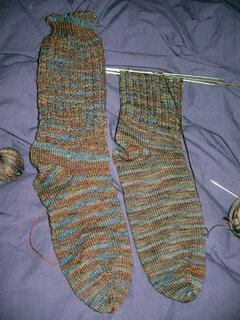 the cuff pattern really draws in a lot--part of the reason these socks are taking so long. 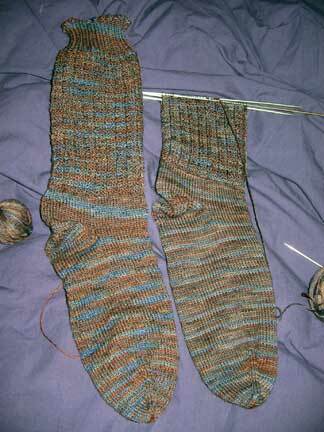 another is that the cuff measures 11 inches from base of heel to top. worth it in the long run, since it is snowing today for the first time all year, and i always enjoy extra leg coverage in the winter. i'm sure she will too. 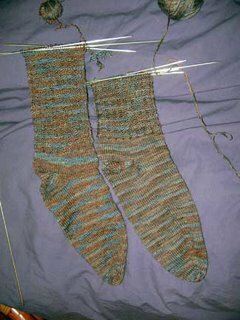 all i have is half a cuff to go on the second sock and i'll be done with the pair. thank god. This has to be about my fifth neight eighth attempt to post a comment about "gargantuan calves" but the Korean keyboard/Windows/IE thward me at every turn! ok, dude--korean keyboard or no--i moderate my comments. therefore i have to approve them before they appear. no need to comment 5,000 times.